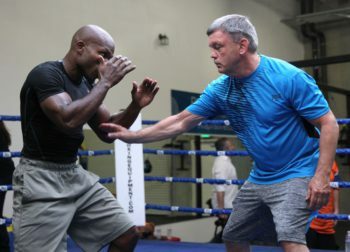 Considering the level of ignorance, incompetence and sophistry that has taken over virtually every aspect of today’s schizophrenic professional boxing scene it was a revelation of sorts—not to mention a breath of fresh air—to discover the recently televised (ESPN) series of five master classes conducted by world renowned boxing teacher-trainer Teddy Atlas. The program’s title, Inside the Ring, doesn’t do justice to the quality of “insider” information and knowledge that is imparted in each of the five segments totaling 47 minutes. Atlas, a protégé of the legendary Cus D’Amato, is the former trainer of Mike Tyson, Michael Moorer, Timothy Bradley and a slew of other notable champions and contenders. For over 20 years he also served as a ringside commentator for ESPN’s televised boxing cards. With the premier of Inside the Ring (first televised in May and June) Teddy’s role as teacher, historian and boxing psychologist is fully realized. The program brought together Atlas and one of the best boxers in the world, the undisputed super lightweight champion Terence Crawford whose current record shows 33 victories and no losses. Last month Terence added a welterweight title belt to his already impressive resume. With both men seated in a boxing ring they reviewed filmed highlights of five of Crawford’s most important fights and discussed how each contributed to the progression of his boxing skills. At its core this program is an engaging and enlightening conversation between an accomplished boxer and a master trainer as they examine and explain the various technical subtleties and strategies on display. What transpires is a wonderful “teacher and student” vibe in which the audience becomes privy to aspects of boxing technique that are seldom revealed or understood. 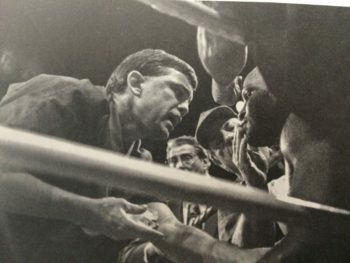 Inside the Ring makes good use of the fight films, often reverting to slow motion so the audience can more readily see what is being described and analyzed. Atlas’s insightful observations, interspersed with Crawford’s astute comments, are both eye opening and entertaining. The mutual respect each has for the other is obvious. Crawford comes off as personable and intelligent. In explaining to Atlas why he decided on a certain strategy Crawford reveals himself to be a thinking fighter who can easily articulate his methodology. What transpires is a wonderful “teacher and student” vibe in which the audience becomes privy to aspects of boxing technique that are seldom revealed or understood. Each episode also includes Atlas and Crawford standing up to demonstrate a significant move or counter move that was utilized during the course of a match. Some of the topics discussed include how timing can nullify speed, how to handle a taller opponent, the importance of footwork for defense, or why Crawford was getting hit by an opponent’s left jab. There is a wonderfully revealing moment during the viewing of Crawford’s breakthrough bout with Yuriorkis Gamboa, a talented fighter with as much boxing skill as Crawford but of late hampered by inactivity and age. A slow motion replay shows Crawford getting tagged with a solid right cross. It was Gamboa’s best punch of the fight. Atlas explains that Gamboa set up the punch with a feint and a “throwaway left hook” that distracted Crawford and left him open. Lesson learned. This type of real boxing knowledge is like imbibing a cool glass of sweet lemonade on a hot summer day. This is as far away as one can get from the mindless “rock ‘em sock ‘em” robotic style of too many of today’s poorly coached boxers. Every moment of Inside the Ring is filled with information that relates to tactics and strategy. Thankfully the overused and simplistic “punch stats” aka “CompuBox” numbers are never mentioned. Atlas and Crawford are less concerned with counting up the number of punches than with understanding and explaining what created the situations for those punches to find (or not to find) their targets in the first place. As opposed to the usual mundane and hyperbolic verbiage that accompanies most televised fights, exposure to this type of real boxing knowledge is like imbibing a cool glass of sweet lemonade on a hot summer day. As of today there are no plans to continue the series. That is unfortunate because ESPN is in possession of a treasure that is not being utilized to its fullest extent. That treasure is Atlas’s extraordinary knowledge and teaching skills combined with ESPN’s vast collection of boxing films from the 1890s to the present. Not only would such a program improve the boxing IQ of every fan, it would improve the overall quality of the sport! How great would it be to experience Atlas analyzing and interpreting the boxing techniques, strengths, and weaknesses of the sport’s biggest stars of the past and present in the setting described above? I have no doubt that such a program would do much to revive, or at the very least improve, the lost art of boxing. It would be a shame if this program was just a one shot deal thus depriving us of future insights into the mysteries of the sweet science. Not only would such a program improve the boxing IQ of every fan, it would improve the overall quality of the sport! In other words, it would be a gift that would keep on giving. Earnie Shavers: Monster Puncher—or Monster Myth?